Home Our Dogs Thank Woo! One of my blogger friends, Turbo, recently posted about a Husky logo in his area, so I thought I should mention my favorite logo from Dieruff High School in Allentown. Here is the picture on their library page, which highlights our playfulness. Here is another picture of one of their real live mascots. Kiska IV is the current mascot. Here she is visiting with some of the students. 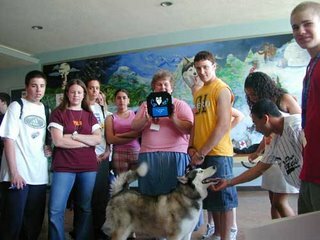 These awesome students don’t come from rich backgrounds or lives of privelage, but they raise money for MaPaw every year to help rescue more Huskies like Kiska. Thank Woo Kids!, It means the world to us!